KIEV, Ukraine -- The conflict in Ukraine has deeply affected the lives of 580,000 children living in non-government controlled areas and close to the front line in the east of the country, the United Nations Children's Fund (UNICEF) said today, highlighting that 200,000 of them – or one in three – need psychosocial support. 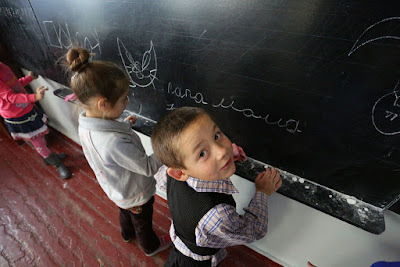 Children write on the blackboard at a school in the village of Staromykhailovka, which is on the frontline between the cities of Donetsk and Mariyanovka, Ukraine. “Two years of violence, shelling and fear have left an indelible mark on thousands of children in eastern Ukraine,” Giovanna Barberis, a UNICEF representative in the eastern European nation, said in a press release. “As the conflict continues, we need to reach these children urgently to meet their physical as well as psychological needs,” she added. According to the UN agency, more than 215,000 children are internally displaced from the conflict-affected areas, and at least one out of five schools has been damaged or destroyed. Last year, more than 20 children were killed and over 40 were injured; out of those, 28 casualties were caused by mines and exploded ordnance. In addition, a polio outbreak was confirmed in Ukraine 19 years after the country was declared polio free, and lack of access to health services and a shortage of medicines are threatening more disease outbreaks. As temperatures plummet, fuel shortages and high prices of coal are also leaving children at risk of respiratory infections. “UNICEF calls all parties to the conflict in Ukraine to ensure safe movement and unhindered humanitarian access to help children in need,” Ms. Barberis stressed. UNICEF has been working with partners to provide children with basic services. To date, this includes providing psychosocial support to over 46,000 children and training almost 5,000 teachers and psychologists to identify signs of distress among children. UNICEF has also reached 1.6 million people with safe water and over 164,000 children and adults with essential hygiene items. Earlier this year, the agency called for an additional $54.3 million to address the humanitarian needs of the most vulnerable children in conflict-affected areas.